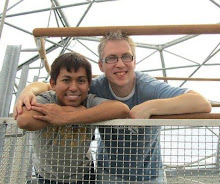 Alternative Eden Exotic Garden: The Babies will be Big Boys one day! Size does matter in the world of exotic gardening! One of the many books that I've read before and has given me inspiration (and ideas) in creating an exotic and tropical look is Big Leaves for Exotic Effect by Stephen Griffith, who also happens to be the curator of Abbotsbury Subtropical Gardens in Devon. 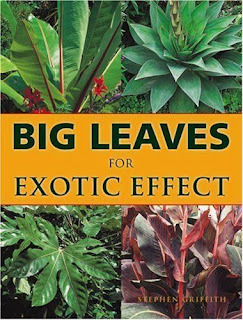 The main gist of the book is that you can use plants that produce big leaves to create an exotic and tropical atmosphere in the garden, even if some of these plants are totally hardy (and not so exotic) in our region. It's a fantastic resource especially if you're just starting with the hobby and after a particular look. Or even if you are very experienced and would like to introduce some changes to parts of the garden using bold, lush, and leafy plants. There are indeed many plants listed and featured in the book and some of them have made their way into our garden, and most have been growing here merrily for the past few years. Admittedly, I haven't flicked through the book for quite some time until recently when I found myself gravitating towards it again. Having read it several times before, obviously nothing's new to me but it did remind me to feature a few new plantings I've done recently that are potential 'Big Boys' in the garden once they have established themselves after a few years. I'm not referring to plants that attain great height and size after years on the ground like trees, and even palms. But more like lush and leafy herbaceous perennials and shrubs that make spectacular displays of large foliage in the spring and summer, but goes dormant and/or deciduous in the autumn and winter. It's these sort of plants that add so much drama to the garden and can add so much to the tropical theme! As what I'll be featuring are just new plantings, they are obviously still small and I'll have to borrow a few images on the net to show their potential size when established. I was slightly hesitant at first to feature new plantings, but on second thought it's also good to show some of our 'little babies' now and keep a track of their progress in months and years to come. They may not be showstoppers yet in our garden but it's good to share what's available out there and hopefully give you ideas of new plants to acquire, especially if they're appropriate for your garden and location. Here's just a few of our 'Babies' that, with time and care, eventually become 'Big Boys' too and reward us with huge leaves for that exotic effect! T. papyrifer 'Rex' is a form of the Rice Paper plant that produces much bigger leaves. I think this plant is a must in jungle style gardens. Ok, not exactly a new plant in our garden as we have one already growing here for the past few years and never fails to perform when it comes to throwing out huge leaves. It's also good at throwing out alot of suckers, some quite a distance from the main plant but they are easy enough to control by pinching out unwanted growth and lifting out the superficial rhizomes. Some of the suckers are even potted and passed on to other gardeners. Not counting the suckers of this one particular plant, why not introduce another one to a different part of the garden? 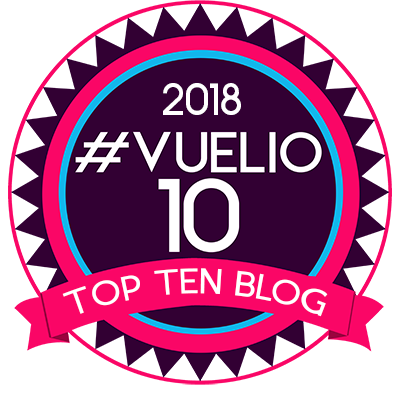 And so we did this year, this time with a plant coming from a different source in case there will difference in their behaviour and vigour (whether better or not). I have high expectations of this new one as our original one did start from this size. A gigantic form of the Shuttlecock or Ostrich Fern. The usual form you see in gardens and sometimes naturalised in the wild can grow up to a metre in height of fronds coming out from singular crowns, but 'The King' is supposed to reach double that size, with fronds up to 2 metres in height! Now that sounds impressive and exciting! After pondering for awhile I finally gave in and bought one a few weeks ago and planted it out the other day. Even at such a tiny size it has several rhizomes already coming out from the rootball, ready to spread and send out more shoots on surrounding areas. This colonising fern can spread out indefinitely but again I find it easy to control with a bit of forking out plants that go where they are not supposed to. Some fern enthusiasts say that you can naturally find two forms in certain parts of the country, one being much more bigger than the other so it's possible that 'The King' is just this sort. Either way if you want one that is supposed to get much, much bigger than the usual then this is the one to go for. I came across this hosta after it was recommended on a gardening forum early last year, and even caused a brief buying sensation amongst members of the forum who got excited at the prospect of its potential size. 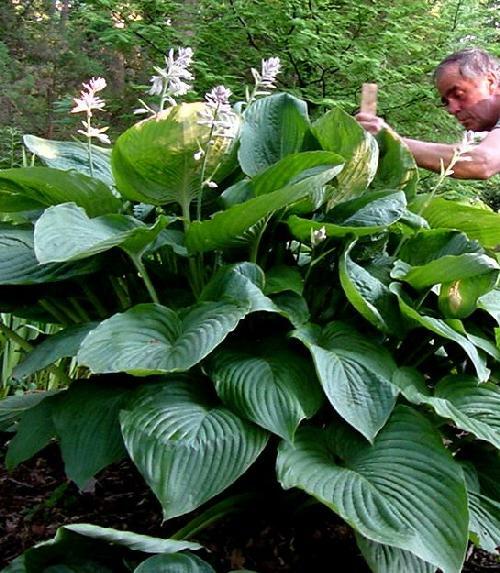 Reputed to be one of the biggest leafed hostas one can grow with leaves that can potentially reach more than 19" in length, it will be a fantastic addition to a jungle style garden. Not exactly a new planting here as it's been on the ground for over a year, but so far so good as it has doubled in size since then. There have been hostas before that were supposed to get huge (some even suggested by their names) but they never really lived up to their expectations, let alone their names. I hope this one is an exception and lives up to it's promise. Somehow, my gut feeling says this one will. Now this hosta I came across with whilst reading more about Hosta 'Empress Wu' and saw a debate aptly titled 'Empress Wu vs. Jurassic Park', whether which one is bigger than the other. It was an interesting debate and the results seem neck on neck. The verdict is still out and I never did get to the bottom of the discussion but it was enough to convince me that I should have one! On maturity the clump can reach up 8.5' wide with leaves that can grow up to 16" by 14'' in size. What I have at the moment may be tiny but based on the photos I have something big to expect in the next few years! These plants are amazing! Please post updates as they develop in your garden. I'll enjoy these plants vicariously since our climate is too hot and dry to support such large-leafed plants. as always your blog and garden are a great inspiration to me..... just off to amazon to order the book lol!! Large leaves would be out of proportion in my little garden, but I look forward to watching your babies grow. Fantastic plants, perfect for your plot. They'd be torn to shreds in my garden by salty winds and pesky seagulls! Do you get many slugs? Wow! Love those large hostas! Amazing! I am glad you decided to let us see your babies and I too will be looking to see if they live up to their reputations in the future. Ahh Gerhard, just look at all those lovely succulents you can grow outside in your location :) These leafy plants really make a great show in the not so hot summers here once established. Thank you for the lovely compliment Libby :) You’ll love the book, very entertaining to read! Martin, leafy plants are indeed a challenge to keep in seaside gardens. We have many slugs but we just keep them under control. 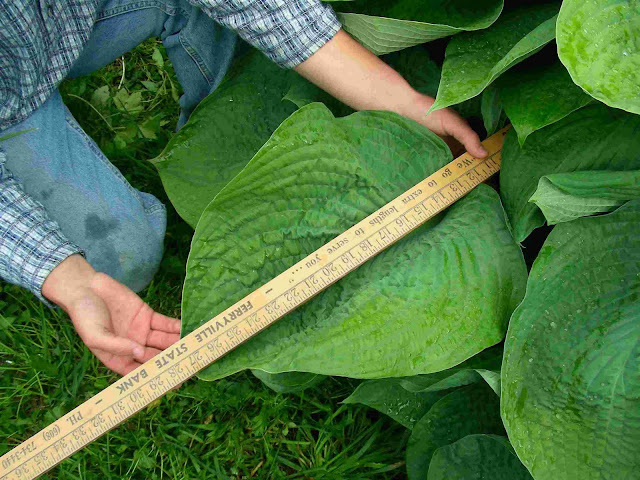 It’s actually a myth that all hostas are slug magnets, some varieties are more resistant than others. HolleyGarden, glad you like them! They would make a fantastic addition to your garden! Your garden is so lush, it looks more tropical than mine. For small gardens, we look for fine leaves, like Japanese Gardens. Hosta ‘Sum and Substance’ is one variety that does well here in Northern California. Its thick leaves seem to make it much more heat-tolerant than others. It also seems to be quite slug-resistant. A fern with 2m fronds would certainly add a jurassic feeling to the garden! I had to smile at the photos of the giant hostas, having just been reading Carolyn's post about the miniature leaved version - just one leaf of one of those monsters could encompass several plants of their dainty cousins! Great idea to show the newly planted still-quite-small plants and then later the monster grown-up result. I will look forward to the images of these plants when mature. Just got back from the city recycling area, one guy was dumping three very large Tree Ferns which hadn't survived this harsh Winter, they had been in his garden for eight years. I also like the herbaceous plants with large leaves, one in our garden which I am very fond of is Rodgersia Podophylla. Janet, 'The King' would look great near your pond :) I do like miniature Hostas too, they look great in pots! Alstair, Rodgersias are another one that can produce big leaves, bone hardy too! We converted our garden to a tropical theme with no grass, but lots of bed and paved patio with a large 5m x 5m canopy. Amongst the cordylines, palms, phormeiums, peonies, hostas etc. are three fatsia Japonicas which looks a considerably larger variety of the plant you have, Tetrapanax papyrifer 'Rex'. Gave up on musas after eighht of them died a death and last years frost seems to have killed off the 4 foot tree fern, but we've left it just in case. Calistomens don't care for our garden much either, I presume the bark covered soil is a bit too damp for them. Well done an good achievement indeed, we feel the same about ours which two years ago, after just two years growth forced me to dispose of eight 6x4 trailers worth of plants as it became so overgrown. Now far more manageable, it has allowed me to enjoy a cup of our favourite Yemeni Matari coffee from our regular supplier The Tea and Coffee Emporium, sitting under the canopy for a rare alfresco breakfast as I write this. Nice selection of plants and good photos, thanks for the post.